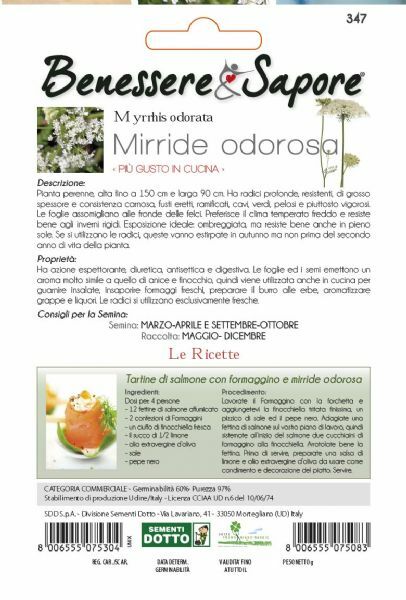 Sweet Cicely (Myrrhis odorata) is an attractive plant that is a striking component of herb gardens and hedgerows. This early flowering perennial is renowned for its aniseed taste and fragrance. Growing to a height of 90cm, umbels of tiny white flowers appear from spring to early summer. The fern-like leaves are deeply divided and smell of aniseed when crushed. 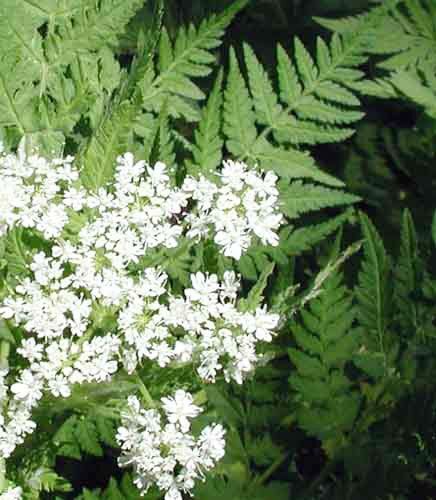 Sweet Cicely was formerly a widely cultivated culinary herb, but now only occasionally grown in the herb garden. 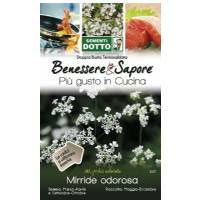 As a culinary herb it is a valuable sweetener, especially for diabetics and for the many people who are trying to reduce their sugar intake. 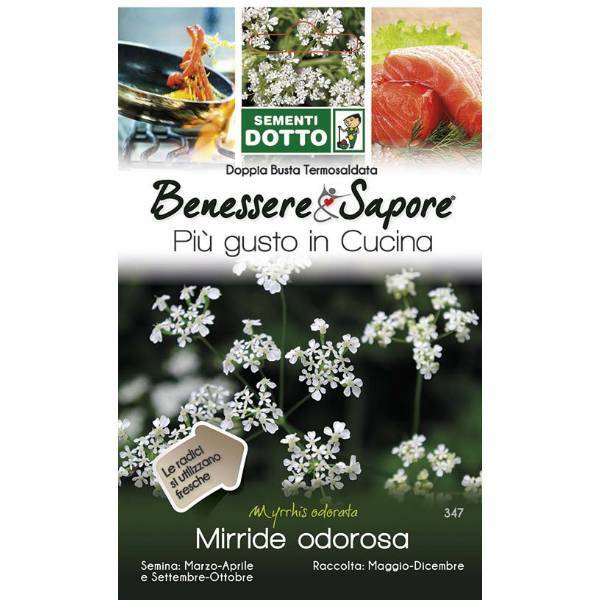 Used in many savory as well as sweet dishes, it gives a delightful flavour and helps to save almost half the sugar needed. 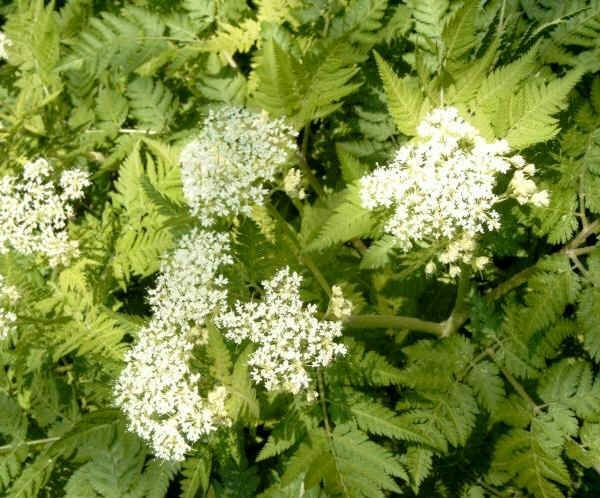 Sweet Cicely has been used in medicine for centuries, all parts of this herb were used. It is good for the digestive system and a wonderful tonic herb, it will lift the spirits and banish gloomy thoughts. The volatile oils and flavonoids in the plant are antiseptic and will purify the blood, act as a carminative and improve appetite. The ripe seeds can be chewed as an aid to digestion and a tea made from the chopped leaves is said to soothe the stomach. A tisane can be made with 1 tsp of dried (1tbsp fresh) leaves to 1 cup of boiling water. Steep the leaves in the water for 10 to 15 minutes then strain and drink a small cup three times a day. Sweet Cicely seeds like many others germinate easily when they are fresh from the plant. As they dry out the germination inhibitors develop and need a period of cold to help break them down. They are easiest grown when sown directly outdoors in a seedbed in autumn. The seeds require several months of cold winter temperatures to germinate. Keep a check on the compost to make sure it does not dry out. Thin the seedlings in the outdoor bed as necessary (eat the thinnings) and transplant the young plants into their final positions in the following spring.